Joseph Abbott was born in August 1843 at Parramatta, the son of gaol official, Henry Kingsmill Abbott and his wife Martha Ann (née Lefroy). He was educated at the Church of England Denominational School at Parramatta but could not stay long as his parents could not afford the fees. As he told electors in Newtown in 1888, his family struggled during his early years and ‘he was one of the people’. He moved to Sydney aged 15. In 1866 he married Margaret Ann Bennett in Surry Hills and the couple lived in Glebe before they moved to Newtown. Five years later they moved to Croydon and in July 1895 Abbott retired from politics due to ill health. Joseph and Margaret Ann Abbott had six sons and three daughters. He died on 15 June 1903. After leaving school, Abbott moved to Sydney and joined several young men’s improvement societies and debating clubs. He was introduced to prominent businessman Thomas Sutcliffe Mort of Mort’s Dock in Balmain. Abbott was employed as a clerk in the produce department of Mort and Company in 1863. He became one of the firm’s auctioneers, inaugurating the Sydney stud sheep sales at Summer Hill quarantine grounds. By 1883, Abbott was a partner, managing director and chief auctioneer of Mort and Company Ltd. He continued as director when firm amalgamated with R Goldsborough & Company in 1888. By the 1890s he was considered the country’s senior wool auctioneer. He later became director of the Commercial Union Assurance Company and of the Sydney Exchange Company. He was also director of the Waratah Coal Company and, for 12 years, of the Australian Mutual Provident Society. Joseph Abbott was a Wesleyan Methodist and a supporter of the Young Men’s Christian Association throughout his life. 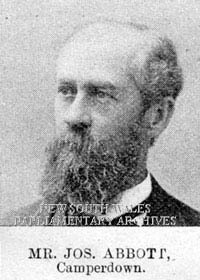 In February 1888, Joseph Abbott was elected to the seat of Newtown in the NSW Legislative Assembly in a by-election. He was the Member for Newtown from 3 February 1888 until 5 July 1895 when he retired due to ill health. He ran on a free trade ticket at the instigation of Sir Henry Parkes. Joseph Abbott was an alderman on Newtown Council from 1875 to 1879, representing O’Connell Ward. Ruth Teale, ‘Abbott, Joseph (1843–1903)’, Australian Dictionary of Biography, National Centre of Biography, Australian National University, http://adb.anu.edu.au/biography/abbott-joseph-2856/text4065, published first in hardcopy 1969, accessed online 10 February 2016.